These tours are designed to bring you into contact with nature and promise to be a lifetime experience not to be forgotten. Geniet u ook zo van de televisiebeelden van Zuid Afrika? Zin krijgen om ter plek eens rond te kijken? Komt dan mee met Pride Safaris en Borwa Afrika Farm tours voor een fantastische vakantie gemaakt op maat. Pride Safaris & Borwa Africa Farm Tours focuses on cultural and nature guiding. Pride Safaris and Tours cover all aspects of South and Southern Africa regarding the cultural diversity of the country, linking it to the beauty and splendour of our fauna and flora. 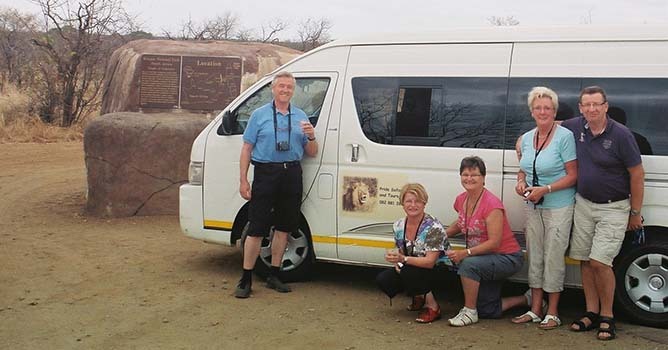 Pride Safaris and Tours, offers a great variety of tours, ranging from day tours, to short tours to Mpumalanga and the Kruger Park to overland tours lasting 21 days. The groups on tour ranging from 4 to coaches with 40 tourists. I am the proud owner of 4 mini buses and a sedan, which I rent to other tour operators or registered guides in the Industry. Best under the African sky.